No I’m not talking about some middle aged man propelling a ball at some objects at the end of a lane, but the games that climax every college football season. Bowl season officially starts this afternoon, here are the matchups for all the college football fanatics out there. Note- I gave the shortened name version of all the upcoming games. Also I listed what broadcast network would be televising the game and what time they would be coming on the air. All times are Eastern Standard. BCS National Championship Game- Texas vs. Alabama Jan. 7 8 p.m.
*- 19 of the 34 games are not scheduled till Dec. 31st or later. I guess college football fanatics are expected to flip channels very quickly on those 3 days(Dec 31-Jan 2) when 15 games are being aired. *- What a downer must it be for Oregon State players and fans. A few weeks ago they were one win from a Rose Bowl trip. Instead they lost to Oregon and are playing in a minor bowl before Christmas. *- The NFL network televises a college football game. I guess that’s the cable sports equivalent of the Sci-Fi channel showing wrestling…. *- The bowls are now set where now certain conference finishers are locked into the same bowl games every year. I understand why the current system is done, but I prefer the day when bowl games would have greater variance from year to year. The Peach bowl would usually invite a ACC or SEC school but they could be creative, like when they invited Army and Illinois. Wouldn’t a SEC team against BYU or Wyoming be nice for a change? *- Bobby Bowden’s farewell game is against the same school(West Virginia) that he left before coming to Florida State. I do know FSU and WV have played at least twice previously in bowls during the Bowden-Florida State era. The Tar Heels gave their Hall of Fame coach his 600th career win Sunday night, an 80-73 triumph over pesky Nevada behind a career-high 23 points from Deon Thompson. Ed Davis added 16 points, a personal-best 15 rebounds and a pair of momentum-changing blocked shots late for the Tar Heels (6-1). Williams became the 33rd coach to reach this milestone, and the 3rd quickest. As I noted yesterday, the ever lengthening College Basketball season is the root cause of this. A good receiver for a team with a need at the position. ESPN writes- Nicks gained 14 pounds between the combine and his pro day and that is reason for concern. However, we still believe he has the ability to make an immediate contribution. He doesn’t have great initial quickness, but he shows good footwork getting in and out of his breaks, and he isn’t going to get pushed around by corners. Nicks also flashes fly-trap hands and the ability to make spectacular catches. His catch during the Meineke Car Care Bowl was one of the year’s most impressive. Are you ready for some bowling? No I’m not talking about some middle aged man propelling a ball at some objects at the end of a lane, but the games that climax every college football season. Bowl season officially starts this Saturday, here are the matchups for all the college football fanatics out there. 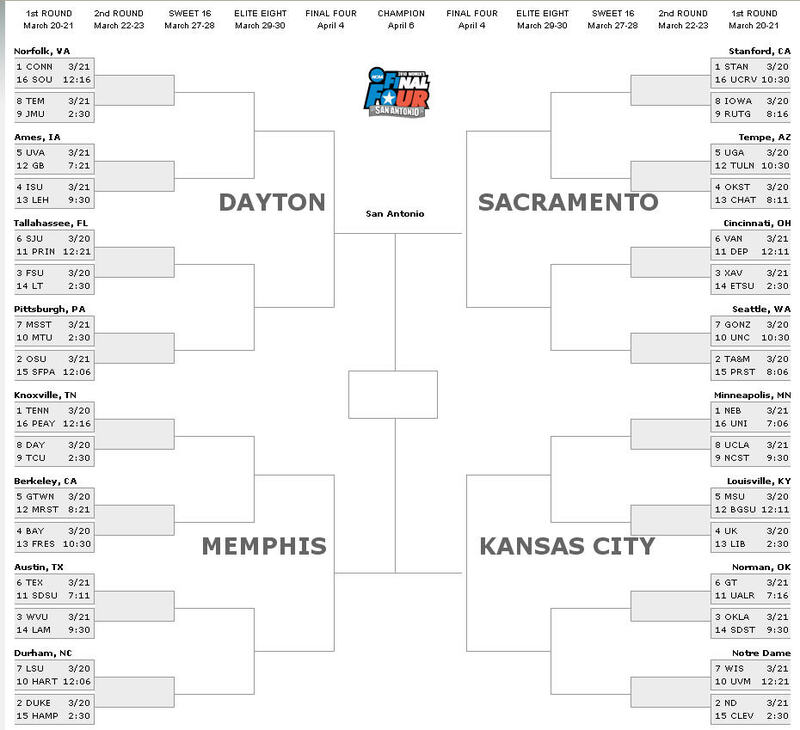 That’s 34 games, 68 schools spread over a period of 20 days for those of you keeping score at home. An ample supply of college football for any fanatics out there. *- There are a few bowl games remaining without corporate names in their title. Gator, Sun, Texas, Independence. Were these games unable to find sponsors? *- Will Oklahoma St. and Oregon combine for 70 pts or more in the Holiday Bowl? This annually has been of the most high scoring affairs. *- Oh how has the Orange Bowl dropped. A game that featured early triumphs of Joe Paterno led Penn State, Nebraska and Oklahoma in their glory days, the first major bowl appearance of Florida State, and the all time classic 84 battle between Nebraska and Miami, has Cincinnati and Virginia Tech playing this year. I’m sure they are talented football teams, but how many people are drooling to see them play in a prime-time network slot? *- Vanderbilt makes a rare bowl appearance. Congratulations to Commodore fans, but this is a sign of how bowls are grown way out of proportion. 6-6 college teams get bids. When I was growing up I could remember Florida State going without a bowl in 1978 even though they finished the season 8-3. It is my humble opinion that bowl season has gotten out of hand. Someone may say what’s the big deal? If someone wants to start a bowl game and there are two schools willing to play in it, does their records matter. A good football isn’t only a contest between stars at big name schools. All true, but how much public money is spent on these affairs? Many of the teams are state universities who get funded by taxpayers. Then there is the game itself where police have to be taken from other tasks to work the day or night of the game or paid over-time. With the economic downturn right now, you have to wonder if there will be less bowls in the near future. That would depend on how long a deal a corporate sponsor signed on for. I wonder how many fans of some schools plan to make a bowl trip. Are there 1,000 or more FAU Owls willing to journey from Florida to Michigan in December to watch the team play? Even if I were a Owl fan and had money, I’d stay home. The 49ers didn’t let much time tick off before grabbing North Carolina nose tackle Kentwan Balmer. The ESPN guys are apoplectic but it’s a great value pick. Strengths: Is tall with adequate bulk and room to get even bigger if necessary. When he plays hard he can be flat-out dominant. Gets good forward lean in stance and displays outstanding initial quickness. Has experience playing DT and NT. Takes sound angles to the ball and makes plays in pursuit. Is playing with a better motor as a senior. He can take on blocks when he stays low. Generally wraps up upon contact and is an adequate open field tackler. Athletic, flashes the ability to redirect inside after setting blockers up to the outside and is a relentless pass rusher. Moves well laterally and runs line stunts well. Shows adequate awareness, times jumps well and he gets hands up when isn’t going to get to the quarterback. Blocked two kicks in 2006 and can contribute on special teams. Weaknesses: Inconsistent effort earlier in career. Is he a one-year wonder? Plays too high at times and will lose his power when he does. Not disciplined enough. Gets sucked inside and upfield too often. Needs to do a more consistent job with his hands and can take too long to shed blocks. 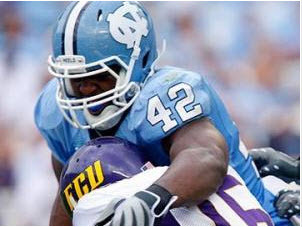 Overall: In his first three seasons at North Carolina (2004-’06), Balmer appeared in 30 games (11 starts) at defensive end and defensive tackle, recording 34 tackles (7.5 for losses) and 3.5 sacks. As a senior in 2007, he started all 12 games and delivered 59 tackles (9.5 for losses) and 3.5 sacks. He had right knee surgery following the 2005 season and missed two games in ’06 after suffering an ankle sprain. Balmer could play DE in a three-man front but we think he’s better suited to play DT or NT in a 4-3 scheme in the NFL. Regardless, he is tall and strong with adequate bulk and outstanding quickness. Balmer can take on blocks, disrupt plays in the backfield and collapse the pocket  but only when he wants to. While he finally displayed first-round ability as a senior, NFL teams must be concerned about this one-year wonder. Prior to 2007 we viewed Balmer as a talented underachiever and the question is whether the light has finally come on or if he will revert to old, lazy habits following his big NFL payday. For a team making the move to a 3-4, this move makes perfect sense. Phil Jackson, Roy Williams, and some people I’ve never heard of have been elected to the basketball Hall of Fame. Phil Jackson can add Hall of Famer to his resume Monday as the current Los Angeles Lakers coach was named to the 2007 basketball Hall of Fame class that will be inducted this September. Joining Jackson in Springfield, Mass., will be North Carolina coach Roy Williams, WNBA coach Van Chancellor, the 1966 Texas Western NCAA championship team, referee Mendy Rudolph as well as international coaches Fedro Ferrandiz and Mirko Novosel. Jackson and the Texas Western squad earned the honor in their first year of consideration. To gain election, each finalist needs at least 18 of 24 votes from the Honors Committee. Jackson’s coaching accomplishments include six NBA titles with Michael Jordan and the Chicago Bulls as well as three more titles with the Lakers. He is also the fastest coach to reach 900 wins. He spent 19 successful seasons as the head coach of the University of Mississippi Lady Rebels. Under his guidance, the Lady Rebels posted a winning percentage of .740 (439-154), made 14 NCAA Tournament appearances. As a collegiate coach, Chancellor ranks 14th in all-time winning percentage amongst womenâ€™s basketball coaches. He has been the Comets’ only head coach, the longest tenured in the WNBA. His team won the first four WNBA championships, from 1997 to 2000. Still, it’s women’s basketball and being 14th best is hardly that big a deal. And the WNBA isn’t exactly the most competitive league in all of sports. UNC’s mascott was struck by a car and killed. Jason Ray, a North Carolina student who performed as a mascot for the school’s basketball team, died three days after being struck by a car hours before an NCAA Tournament game. He was 21. Ray died Monday morning, said Steve Kirschner, the university’s associate athletic director for communications. An NCAA official told ESPN.com that the men’s basketball tournament selection committee is discussing with the four Final Four teams to determine how they will memoralize Ray’s death prior to Saturday’s national semifinals. Ray had been in critical condition at Hackensack University Medical Center since the accident Friday afternoon. He was hit from behind while walking on a highway shoulder near his Fort Lee hotel after going to a nearby convenience store. Ray performed as UNC’s ram mascot, Rameses. He was scheduled to graduate in May with a major in business administration and a minor in religion. He was in New Jersey for the men’s game between North Carolina and Southern California. Emmitt Ray said his son “absolutely loved” dressing up as Rameses, despite the costume’s bulk. No charges have been filed against the driver of the sport utility vehicle. Police said the driver stopped immediately to try to help Ray and called 911. Police also said the driver had a valid driver’s license and did not appear to be under the influence of alcohol or drugs.